Since we and friends each leased a Chevy Bolt in November 2017, we've watched prices rise and stay high. Several of our friends and acquaintances have considered a Bolt, GM's first mass-produced, all-electric car. They've been turned away by the cost. In part this is due to the good deal we negotiated with our local Chevy dealer here in Bakersfield. Our non-electric friends want the same deal or something similar. It doesn't appear that GM is going to dramatically drop the car's price this year. They've opened up sales of the Bolt to both Canada and Korea and that may be keeping supply tight. However, all-in monthly lease cost for a Chevy Bolt here in California recently dropped from around $350 to $300, according to the survey ev-vin.blogspot.com. What does that mean for the cost of ownership, considering the substantial subsidies here in California's San Joaquin Valley? As explained in Our Lease of a Chevy Bolt and What it Cost Us, we're paying $250 per month for a Chevy Bolt LT with the DC fast-charge port and heated front seat options. That's an all-in cost for a three-year lease with 10,000 miles per year. We didn't pay anything down. Less state and regional subsidies, our cost to lease the Bolt is only $83 per month. Our Bolt replaced a Nissan Leaf, which in turn had replaced a Toyota Prius. Less the $13 per month we save on gasoline by not driving the high-mileage Prius, our cost to lease a Chevy Bolt is only $70 per month. This is really hard to beat. Of course there are other costs to owning a leased electric car. 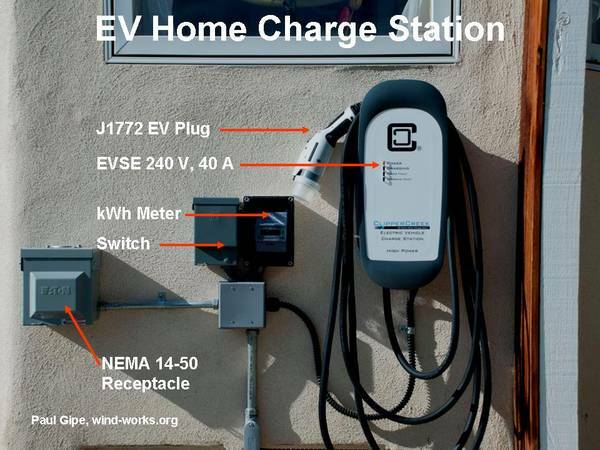 The home charge station, or EVSE, is the main one. Since we had installed the EVSE for our Leaf and our Chevy Volt, I'd already depreciated that asset. There is also the cost of returning the car after the lease is complete, often about $400-$500. Nissan never charged us this disposition fee when we returned their Leaf to them. I don't know why. They just never did charge us. In the summary below, I don't account for either the EVSE, or the disposition fee. Here in California, the state offers a rebate, or subsidy, of $2,500 if you buy an approved EV. Our regional electric utility also offers a subsidy of $500. 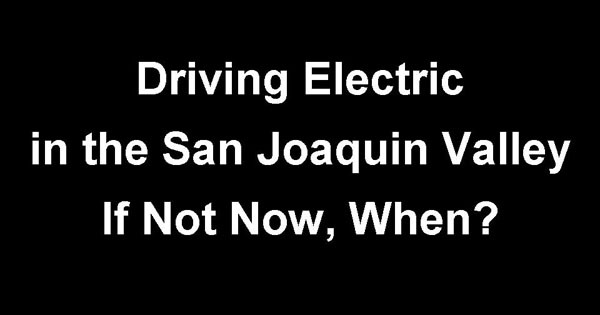 On top of that the San Joaquin Valley Air Pollution Control District offers an additional subsidy of $3,000 to drive electric. That's $6,000 in subsidies for a three-year lease. For low-income households, the state and regional air district offer even greater subsidies. If you can lease a Chevy Bolt LT with what we consider essential options for an all-in cost of $300 per month, your monthly cost to drive a new electric car with a 60 kWh traction battery will be $133 per month. 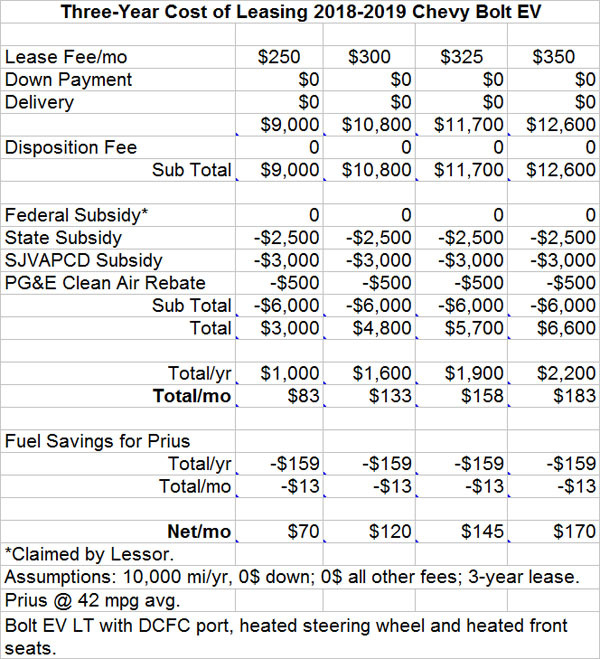 If you have to pay $350 per month for a Bolt EV with these options, your total cost is $183 per month. This is about what I pay per month for business service on my land line phone. Others pay comparable amounts for their digital entertainment packages. 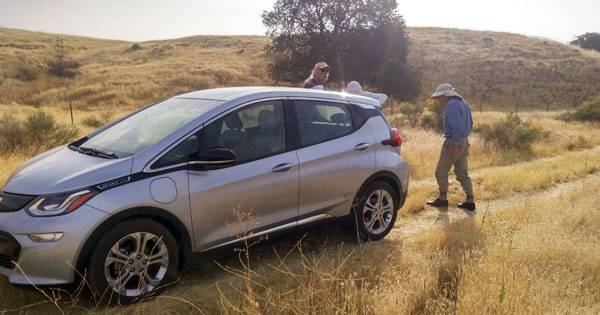 For those who want to drive an electric vehicle with a range rivaling that of a Tesla S60, now is a good time to lease a Chevy Bolt in the San Joaquin Valley.